A Boston Globe, San Francisco Chronicle, and Time Out New York Best Book of the year, and more . . .
Like the work of Cormac McCarthy, Denis Johnson, Richard Ford, and Annie Proulx, Battleborn represents a near-perfect confluence of sensibility and setting, and the introduction of an exceptionally powerful and original literary voice. In each of these ten unforgettable stories, Claire Vaye Watkins writes her way fearlessly into the mythology of the American West, utterly reimagining it. Her characters orbit around the region's vast spaces, winning redemption despite - and often because of - the hardship and violence they endure. The arrival of a foreigner transforms the exchange of eroticism and emotion at a prostitution ranch. A prospecting hermit discovers the limits of his rugged individualism when he tries to rescue an abused teenager. Decades after she led her best friend into a degrading encounter in a Vegas hotel room, a woman feels the aftershock. Most bravely of all, Watkins takes on – and reinvents – her own troubled legacy in a story that emerges from the mayhem and destruction of Helter Skelter. Arcing from the sweeping and sublime to the minute and personal, from Gold Rush to ghost town to desert to brothel, the collection echoes not only in its title but also in its fierce, undefeated spirit the motto of her home state. 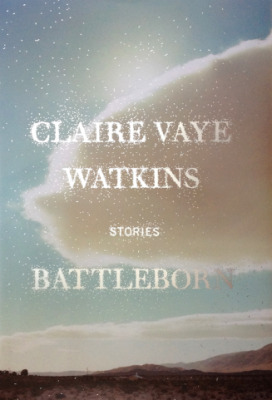 Claire Vaye Watkins is the author of Battleborn, winner of the Story Prize, the Rosenthal Family Foundation Award from the American Academy of Arts and Letters, and a Silver Pen Award from the Nevada Writers Hall of Fame. Battleborn was named a Best Book of 2012 by the San Francisco Chronicle, Boston Globe, Time Out New York, and Flavorwire, and a Best Short Story Collection by NPR.org. In 2012, the National Book Foundation named Claire one of the 5 Best Writers Under 35. Her stories and essays have appeared in Granta, One Story, The Paris Review, Ploughshares, Glimmer Train, Best of the West 2011, Best of the Southwest 2013, and elsewhere. A graduate of the University of Nevada Reno and the Ohio State University, Claire has received fellowships from the Writers’ Conferences at Sewanee and Bread Loaf. An assistant professor at Bucknell University, Claire is also the co-director, with Derek Palacio, of the Mojave School, a free creative writing workshop for teenagers in rural Nevada.